Are there any recruitment fees? The recruitment service is free of charge as long as you use us as your Training Provider once we have found you the right candidate. For more information, see the Recruitment Commitment Statement at the bottom of the page. How do you find the candidates? We advertise our vacancies on the official government webpage ‘Find an Apprenticeship’, our website and we also link with local schools, colleges and other agencies that work with young people. If you prefer, you can recruit your own employee/apprentice and then refer them to OTC for an apprenticeship. Your new employee will still need to go through our apprenticeship recruitment process to ensure that the apprenticeship is the correct programme for them. We have an existing employee we would like to up-skill. Can they be put on an apprenticeship? You will need to demonstrate that your employee requires “significant new skills and knowledge” in order to meet the ESFA eligibility requirement for funding. Your employee will also need to go through our apprenticeship recruitment process to ensure that the apprenticeship is the correct programme for them. For further information regarding employee referrals, please contact us. How much do we have to pay an apprentice, per hour, if they are over 18? For the first year of the apprenticeship you are required to pay them at least the current National Minimum Wage apprenticeship rate. On completion of the first year, if an apprentice is over 18 they must be paid minimum wage. Will I have to contribute towards the cost of the apprenticeship? This depends on the size of your organisation and/or the individual you take on. When can the apprentice start training at OTC, do we have to wait until September? The benefit of our apprenticeships is that you can start someone at any time of the year. It typically takes 2 weeks from completing the sign-up and selecting the apprenticeship programme and units before they will commence in the Training Centre. During this time, the apprentice will be working towards gaining skills and knowledge in your workplace – this is off-the-job training. What does the 20% off-the-job training mean? Off-the-job training must make up at least 20% of the apprentice’s contracted hours, over the total duration of the apprentice’s planned training period. The majority of off-the-job training is generated by the apprentice attending OTC or working towards their e/portfolio. The remaining training will be completed in the workplace. Such things as shadowing colleagues, being mentored and internal training are all typical examples of off-the-job training. We have a simple worksheet that the apprentice will fill in at each progress review to plan and evidence the off-the-job training. 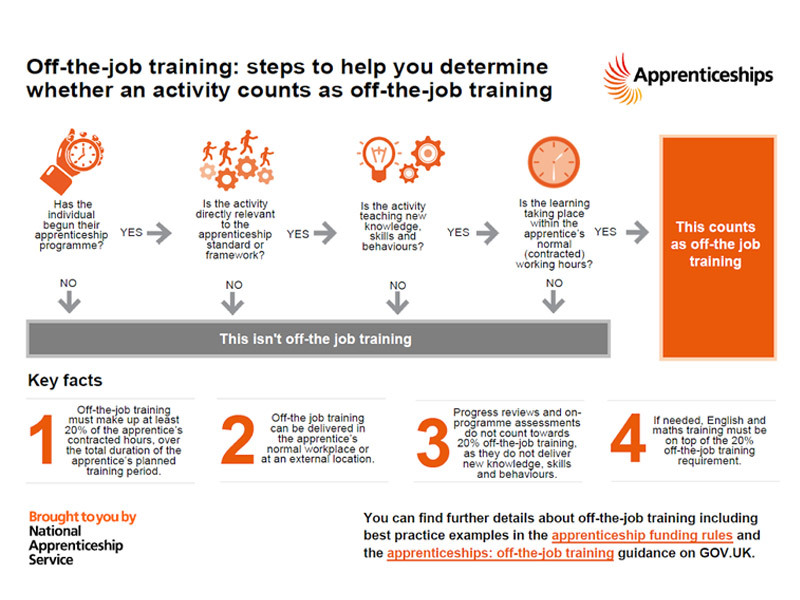 You can find further details about off-the-job training including best practice examples in the apprenticeships: off-the-job training guidance on GOV.UK.